Farengar asks you to deliver some frost salts to Arcadia. Does he need a love elixir? 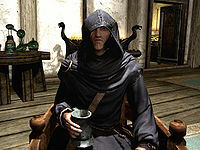 Farengar Secret-Fire is a dedicated court wizard serving Jarl Balgruuf the Greater at Dragonsreach in Whiterun. Most of his time is spent studying and advising the Jarl on the current dragon threat. However, he does have time to assist the locals in town. If you ask him if he is the only wizard in town, he will acknowledge that while, technically, he is alone in his craft, the town also holds other practitioners. And, since he's on the subject, he remembers he has some frost salts he'd promised to pick up for local alchemist Arcadia, the proprietor of Arcadia's Cauldron. He asks if you wouldn't mind delivering the frost salts; Arcadia will surely compensate you for them. When you tell him you will help him out, he will respond with a disparaging remark, but will hand you the frost salts, a quest item not to be dropped. Head to Arcadia's Cauldron and enter during regular business hours, specifically between 8am and 8pm, or even when she strolls around the main trading room in the evening; as always, she will claim you have a fatal disease in hopes you will buy one of her potions, but will be grateful for the salts. She then reveals she needs the salts for a love elixir meant for the unsuspecting Farengar, and will then hand you three potions as compensation. Additionally, as you have now earned her friendship, almost all the various ingredients and potions in her shop are free to take. On the PC, it is possible to use the console to advance through the quest by entering setstage FreeformWhiterunQuest05 stage, where stage is the number of the stage you wish to complete. It is not possible to un-complete (i.e. go back) quest stages, but it is possible to clear all stages of the quest using resetquest FreeformWhiterunQuest05. This page was last modified on 22 June 2018, at 04:56.